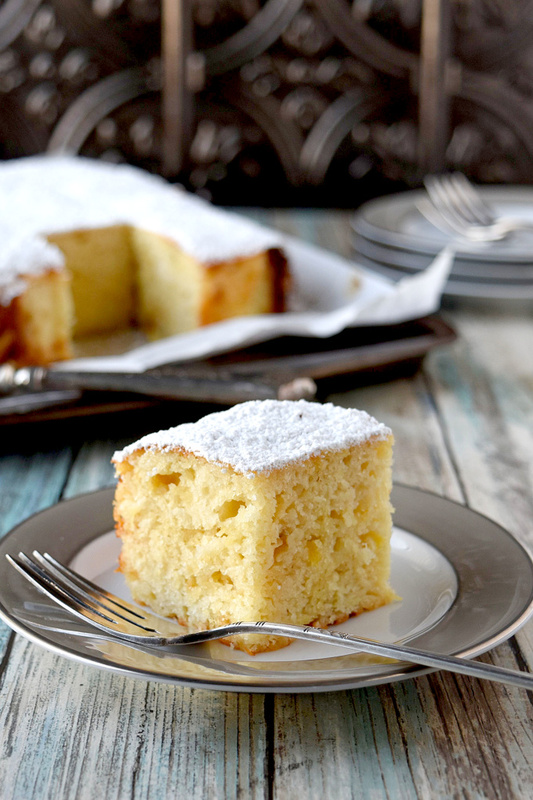 Moist Pineapple Snack Cake is slightly sweet, super moist, and most definitely irresistible. You might want to bake and take so you don’t eat it all. But if you do it’s okay. It’s healthy-ish. Cake is awesome. Isn’t cake awesome? That moist crumb, the frosting, glaze, or simple sprinkling of powered sugar. Cake is versatile and varied in all its flavor combinations. However, we don’t get cake often here. If I bake cake, the hubs will eat one or two pieces and then it’s “too dry” for him to eat. Okay. Whatever. So, just put more whipped cream on it! I mean, how hard is that? Why can’t I bake a cake and not have to eat half of it myself not matter what I put in it? I think the only cupcakes I’ve made that the hubs liked were pineapple cupcakes I made with pineapple in the batter. Those he said were moist and delicious. Not that the other cakes weren’t delicious. They just didn’t hold up to his moisture expectations, I guess. So, I did some research about what I could add to the batter to make it moister. More butter or more fat. Not really an option here. The hubs has cholesterol issues and we try to keep our fat content down. Then I stumbled on adding yogurt to make baked goods moister. And that’s when I knew I had to try adding fruit and yogurt to this snack cake. I’ve been looking into eating more yogurt. The hubs has some stomach issues and I’ve been having some lately, too. This always makes me think of probiotics and a healthy gut. I think about fermented foods, kombucha, yogurt. These are things I think about when my husband has stomach issues. But you have to be smart about your yogurt. It has to have live cultures. And it needs to have a bunch of clinically proven bacteria that helps your gut. Like the kind of bacteria that are in Nancy’s probiotic yogurts. You see, not all probiotics are the same. Each one has a purpose from helping to boost your immune system to helping your gut floor. Nancy’s has the broadest range of overlapping probiotics to help you in so many ways. And their yogurts have more than a dozen types of cultures in every product. Granted, all these cultures will not survive baking in this cake. However, you could top your cake with a yogurt glaze. You could just eat the rest of the container with some granola. Or just straight out the carton with the rest of your pineapple. Yogurt, especially Nancy’s yogurt, is very healthy and good for you. It contains protein which keeps you full longer, too. As if all this healthy stuff wasn’t enough, Nancy’s is sustainable. They were sustainable before it was even cool to be sustainable. They installed solar panels in 2008 and haven’t looked back. You can even track their solar power progress live. That’s unheard of! They even encourage their customer to reuse their containers in any way they can. Now, I’ve had quite a lot of yogurt. Not every brand on the market, but quite a few. Even some I’ve never heard of before. Nancy’s yogurt is the creamiest and most delicious yogurt I’ve tried. It’s not tart like some. It’s not sweet like some. Their yogurt is perfectly balance and so delicious. And that’s part of what makes this moist pineapple snack cake, well, moist! Adding the yogurt means you need to add a little extra leavening. So, there’s baking powder and baking soda in this cake. This also adds to the moist and airy texture of this cake. The flavor? Moist. I don’t think I can say that enough. It’s not overly sweet, which is perfect for us. And it has a hint of pineapple flavor this is delicious. I thought about making a maraschino cherry glaze on top sort of mimic a pineapple upside down cake, but I didn’t. I thought it might make it too sweet. But you topped with powdered sugar? Yeah, I hear you. But that powdered sugar doesn’t make it overly sweet like a glaze would. Powdered sugar is more than just sugar. Did you know it has cornstarch in it? Just to keep it from caking. So it’s not all sugar and, to me, doesn’t taste as sweet as a glaze would be. Just look at that crumb! You can see the flecks of pineapple throughout. It has the perfect ratio of sugar to pineapple. One doesn’t overpower the other. 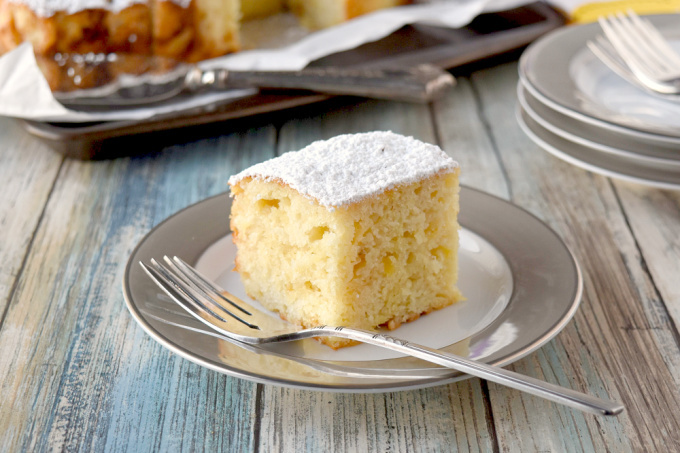 This moist pineapple snack cake is also moist without being heavy. It’s light and oh so good. I cut these into 16 pieces. It’s called a snack and not a cake cake. So, the smaller pieces make them a few bites worth, perfectly sweet, and just the right size to curb your sweet tooth without eating too much cake. But feel free to cut this into as many pieces as you want. It’s your cake. Today is the last day for #SpringSweetsWeek. Make sure you enter the giveaway. You can see the prize detail from my PB&J PEEPSomars. There are some killer prize packages to win. So, be sure to enter. Also, get a head start and follow Nancy’s on Facebook, Twitter, Pinterest, and Instagram. You can get recipe ideas, coupons, and creative ways to use their containers. While you’re at it, scroll down and see what the rest of the bloggers shared on our last day of this event. Combine the flour with the baking powder, baking soda, and salt. Stir with a whisk and set aside. Cream the shortening (or butter if using) and the granulated sugar until creamy. Add the eggs one a time stirring after each addition. Stir in the vanilla, pineapple with juice, and yogurt until smooth. Add the flour mixture to the pineapple mixture. Stir until just combined and no visible spots of flour remain. Allow the mixture to sit 10 minutes. Line an 8 x 8 baking dish with buttered parchment paper. Pour the batter into the baking dish and bake at 350 for 35 to 45 minutes or until a toothpick inserted in the center comes out easily. It doesn’t have to be clean when it comes out. There can be a few moist crumbs sticking to it. Cool in pan 5 minutes then remove to a wire rack to cool completely before slicing. I garnished mine with powdered sugar, but you could whip up a maraschino cherry glaze for an upside down pineapple flavor. This cake sounds delicious Christie. I can’t wait to try it. And I was equally as impressed with Nancy’s Yogurt as you were! So moist and delicious. I hope you like it! 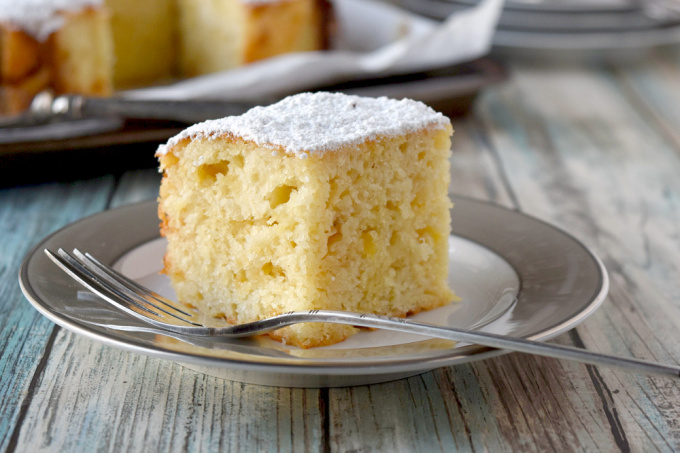 Pineapple in cake lends such a great flavor. Doesn’t it? And adds to the moistness, too. 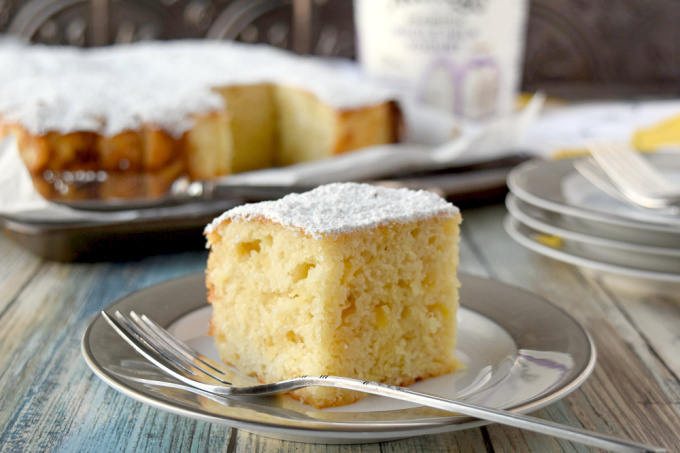 It’s hard to find many desserts with pineapple in them so I can’t wait to give your cake a try! That aren’t upside down pineapple cake, right? I’ll be making this one again. Let me know how you like it! That crumb! It’s so gorgeous. I love that there’s a whole cup of yogurt in your cake! Thank you! I can’t wait to make it again. I have a can of pineapple I had no idea how I’d use it. I can make this awesome cake! Thanks Christie! There’s always one in the pantry for some reason. I think relatives sneak them in there just to mess with us. I hope you enjoy it.